A woman and her dogs’ had a lucky escape after her dream car was written off as she stopped to avoid a pothole. Julie Astridge and her pets - Chester and Cracker - were badly shaken after being involved in a crash as they travelled back from an evening walk in Loxwood. The Clemsfold resident had only had her £6,000 Toyota Avensis a week when she was forced to slam on the brakes after coming across a giant hole along Loxwood Road, near Tisman’s Common, on Saturday April 14. Her Australian Cattle Dog Cracker and her Border Collie Chester were in the boot of her car at the time as a car collided with the back of her vehicle. She said: “It’s been horrible. I’m just shaken up and really shocked and annoyed about it all as it could have so easily not happened. Julie used to live in Loxwood and had travelled to the village for a brisk evening walk and to give her new car a run-out. She said: “I walk there quite regularly but I haven’t been up there recently because the weather has been bad. “In the road on the way I did notice the pothole but it was on the other side of the road. She said she saw the cone but was unable to go around it as there was a car coming in the opposite direction. She slammed on the brakes and that’s when the collision happened. Julie said no-one was hurt - including her dogs’ who had a lucky escape - but both cars were written off. She said: “The accident would not have happened if the pothole wasn’t there. “The people in the house nearby said ‘we have been waiting for something like this to happen, we have been complaining about this pothole for months’. West Sussex County Council said it was concerned to hear about the incident. A council spokesman said: “We are concerned to hear of any accident. However, we are unable to comment on individual incidents. 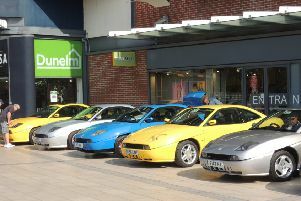 Julie added: “I had spent weeks looking for my dream car and got a cheap one although it was £6,000.